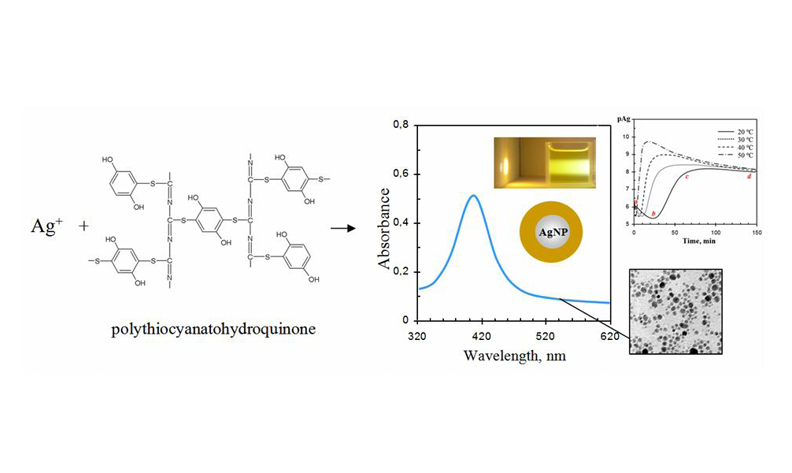 Motivated by evidence that silver nanoparticles have found numerous technological applications we have explored in this work utilization of polythiocyanatohydroquinone as a new efficient reducing and stabilizing agent for the preparation of such nanoparticles. The formation of silver nanoparticles has been confirmed by the UV–Vis spectroscopy, X-ray powder diffraction and by transmission electron microscopy. The potentiometric and spectroscopy kinetic measurements during the nanoparticles growth are also presented. Thermodynamic activation parameters for the silver nanoparticle formation have been determined from the reaction kinetic studies at variable temperatures. On the ground of observations using these techniques, a mechanism for silver nanoparticle growth has been proposed. The narrow size (20–40 nm) and spherical shape distribution of the fabricated nanoparticles together with the high stability of colloids for sedimentation provide a firm basis for applications of the polythiocyanatohydroquinone polymer as a reducing and stabilizing material for the metal nanoparticles preparation and storage.